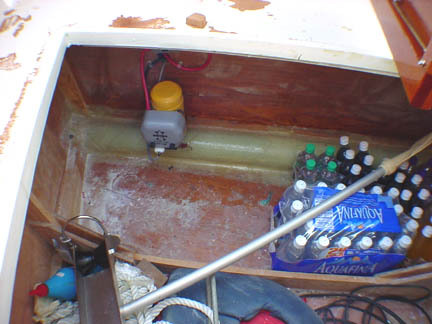 This page is for some of the things I might do different if I were to build this boat again. Let me start by saying that Mark has done a great job of drawing this design and the boat is perfectly functional as drawn as evidenced by Mark's thousands of miles he has logged in the last 3 years. He has always been willing to answer all my questions I had during the building process. If I were going to use the boat casually I wouldn't change a thing. As a liveaboard and voyager I would make some of the following changes with Mark's imput. I would make the helm station extend further into the salon to give more space for the electronics. When I have the GPS, Bow Thruster buttons, gauges and switches it gets a little crowed behind the wheel. I'm not sure where the compass is going to end up. I've bought 3 models and I still don't have an answer. Making the helm come back further would also give more room for the batteries also. 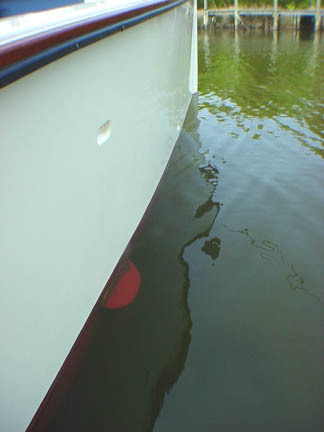 I have fitted a bow thruster in front of the forward cabin bulkhead and with a few modifications to make up for the lack of depth at the water line I think it will be a welcome addittion for docking in current or a breeze. Update: The bow thruster was pulling in a lot of air so I went back to the shop and made some "eyebrows" to go over the top of the openings to make the truster think it was further under the surface. The shapes are a little bigger than your hand and were put on with epoxy and thru bolted. They look like little wings and really improve the way the truster works. I had a lot of people say that we couldn't make it work but I have proven them all wrong. The thruster gives a lot of confidence in tight docking. 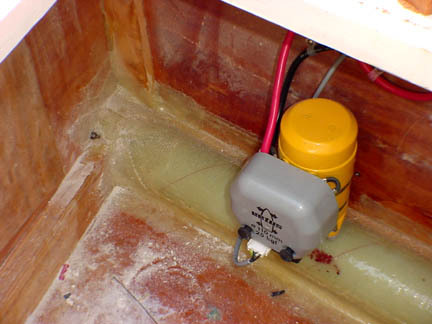 I just added the pictures below to give you an idea of what the thruster really looks like in the boat. The other picture is of the "eye brows" over the tube openings. I would coat every panel of plywood with epoxy on both sides before it went in the boat. I have had to go back and coat the ones that didn't get done and it would have saved time to do it during the building process. I'll post more thoughts as I think of them. The more miles we get on the boat the more refined it will get. Note: After cruising the boat more than 4000 miles I don't really know if I would change a thing. It's all worked out really, really well.